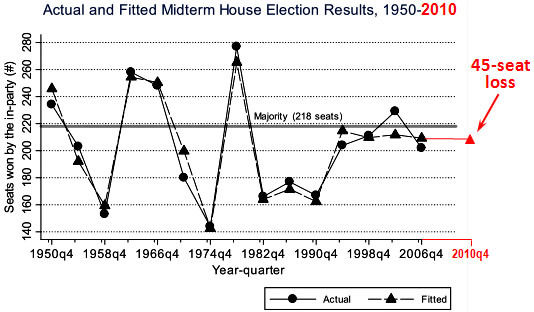 The in-party is expected to win a baseline constant of 62 seats, plus a number of seats equal to about 62% of the number won at the previous on-year election (the incumbency effect), minus around 1.4 seats for every percentage point of the sitting president’?s vote margin in the previous on-year election (the balance effect), plus almost 10 seats for every percentage point of growth in per capita real disposable personal income over the congressional term. The point is not that structural factors determine everything, and that policies or communication or other tactical decisions have no impact. The point is to center the discussion around a realistic baseline…..It’s worth keeping in mind beforehand a clear sense of what sort of result we would expect if the president’s policies and political strategy made no difference at all. That’s about a 45 seat loss….If you want to have the “what did Obama do wrong” argument, you first need to establish what “wrong” would look like. Chait thinks that the Hibbs prediction of 45 seats is too low, but I’m willing to go ahead and accept it. Basically, it provides a reasonable baseline. If Democrats lose 50 seats, it’s fair to say they did something tactically wrong. But that “something wrong” only cost them five seats. Aside from that, they blew it by not being more aggressive about stimulating the economy. Unfortunately, that mistake was mostly made during Obama’s first year in office. By the time 2010 rolled around, there wasn’t much left they could do about that.